I started just taking pictures of the bands I liked at the time, and things I wanted to remember for myself. Most of the rock concert things were taken for no pay. It was later on when I was able to sell some shots. These pictures are really from the point of view of a fan, not a pro photographer. - What kind of equipment where you using at that time ? I was using a Pentax K100 SLR with a 135mm telephoto lens, and sometimes a 55mm lens for wide shots, but mostly the 135mm which is a great lens. I also used a Cannon AE1 SLR for some shows. That AE1 camera was a little more automatic for the exposure, but automatic features can ruin some shots. I used Ektachrome 200 slide film, and Kodacolor 200, sometimes 400. I have an average of three good pictures per roll of 36. Or one good shot per 20 pictures taken. Rock concerts are not easy to shoot well. I never used a flash ever at concerts. One reason is that is distracts both the artist and the audience, and it washes out the stage lighting. The stage lighting is a major reason that there pictures look as good as they do. With a flash I would have had more sharp clear photos, but they would have lacked that "in concert" look that is so special, all those cool stage light colors really are important to me. And I don't want the artists to be mad at me for pointing a flash in their faces. I heard their LPs from friends who had Australian imports of the first few albums. I thought they were good, and I bought the red vinyl Canadian Powerage LP which was also very good, But I was not completely blown away until hearing Highway to Hell. This was the first one where I liked every song. 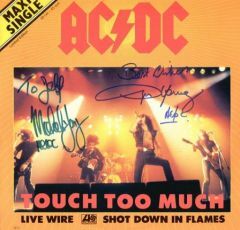 So when I saw them in 1980 I'd heard several albums, but I think I only owned Powerage and Highway to Hell. 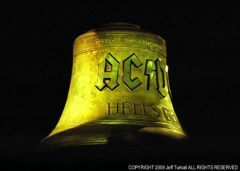 - What does AC/DC represent for you as a photographer? Well, on one hand they were easy to photograph because the lighting was so good, a very well produced stage show. On the other hand, they were very difficult because Angus does not stay very still (as you know), so right when you have camera in focus and on Angus, he moves and you are no longer have good focus. Or the lighting changes so much that you must reset everything. This was back before auto focus, so I had to refocus camera every 4 seconds, this is hard, and after 90 minutes of that you are pretty won't out. But as a live act, and as a stage show, it was very professional and well done, so that makes it easier to get good pictures. 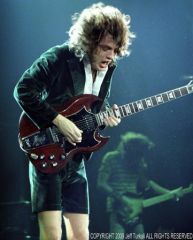 But I have many pictures of Angus Young that are a total blur. - Over which period of time have you regularly shot them? 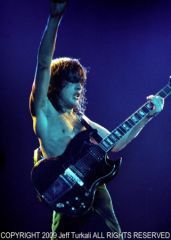 I have only shot AC/DC once, and that was the 1980 tour. - Have you seen the band on stage with Bon Scott ? Did you meet him ? No, I've met Angus and Malcom several times over the years, but never saw them with Bon. - There's always something special out of the pictures from the Back in Black tour. Power, energy, rage. How would you explain that? Had AC/DC something to prove, again ? Well, I think it was both something to prove with the new singer/band member. But mostly I think it was confidence in the new album, they were happy with it, and happy to be out playing it live. - How would you describe AC/DC's state of mind during the Back in Black tour ? As mentioned, that confidence and their energy level comes through in the performances. Confidence and energy is a pretty powerful combo, and it likely is their state of mind. But I never asked them at the time. I met them years later. - What did AC/DC bring to the Rock'n'roll on-going history? 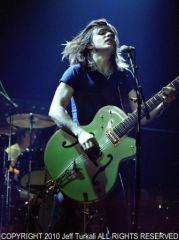 They were influenced by old blues and early rock, and they continued a tradition, but added a lot of wattage to the sound. Angus said that the UK band Slade was a major influence on their sound. I can hear that. So to me they simply carried on a tradition, and did sort of what Slade were doing, but did it even better.. I like "Powerage" with things like Riff Raff, "If You Want Blood" because it's a live album featuring some of the best older material. and "Highway to Hell" which has such good sound quality, the mix is perfect. You get to see a band get better here with each record, and since I like live albums when they are recorded well, I had to mention "If You Want Blood, You Got it." Two of them most fun bands I ever shot were The Rolling Stones & Van Halen. Van Halen were in a way like AC/DC, they were on the verge of making it very big, and had all the confidence a hit album can bring, and all the energy youth can bring. Youth and confidence is another good combo in rock & roll. The Rolling Stones were great fun, they stood still at times so I could get a picture, and get a good picture. It's nice when the bands help you get that great shot. AC/DC, Van Halen, and the Stones were all great fun and were helpful. I shoot and edit video, doing projects unrelated to music. I did not find the bands in the 90s and later to be as exciting as the late 70s and the 80s. It became cool for artists to just stand there, and not put on a show. Not even dress up a bit. The alt. rock, and grunge movements were not as interesting to me, especially after seeing bands like AC/DC at the top of their game. Not really, but I would like to thank you TI TAN for the interest in my photography. 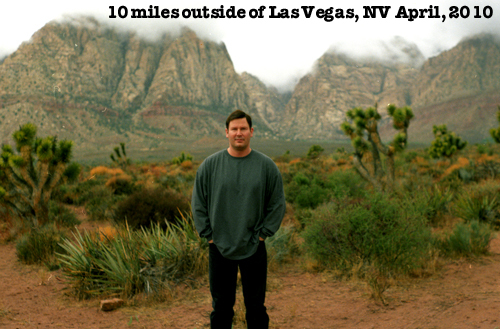 I hope your site visitors get a kick out of the pictures and that people find them fun. They are supposed to capture the "fun" which is not an easy thing to do.